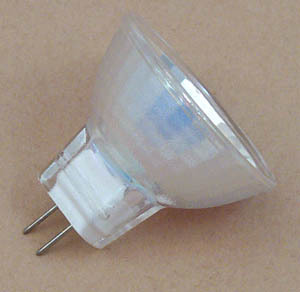 The above pictured lamp has a GU4 2-pin base. MR11 lamps are available with a number of different bases. MR11 refers to the glass diameter which is 1-3/8" or 35mm. If you do not find the MR11 lamp you need below please email your voltage, wattage, beam spread, base, and cover requirements. These lamps can be manufactured in a number of different voltages, wattages, beam spreads, bases, with and without covers. Covers are also available in a variety of colors. When you find the lamp in the list below that you need you can click on the link in the left column to order with our shopping cart.